Are you planning the ultimate birthday surprise for a fun-loving, adventurous friend? What do you give the Birthday Boy or Girl that has everything? Surprise that special somebody with a belly dance show! Birthdays are one of the most popular occasions to hire a belly dancer. 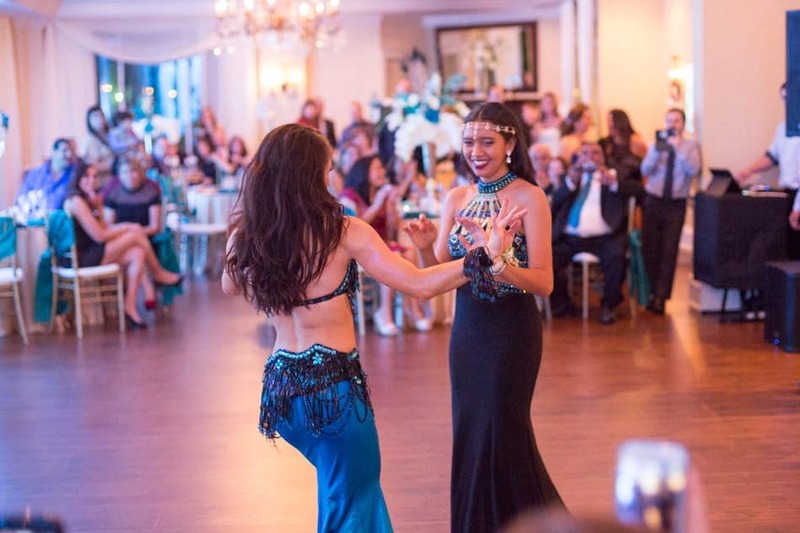 Carrara’s belly dance shows combine exotic elegance with a whole lot of audience participation for a fun, family-friendly experience that guests of all ages will enjoy. Whether you’re planning a stylish Arabian-themed soiree for your sweetheart or a casual house party for a friend, Carrara will make the Guest of Honor feel like a VIP and get the whole crowd dancing the night away! Keep it a Surprise: There’s nothing like seeing the look on the Guest of Honor’s face when they are blown away by a surprise appearance. We strongly encourage all clients to keep the show a surprise, even if it means getting creative! Think of ways to distract the Birthday Boy or Girl while you sneak the entertainment in discretely. Belly Dance is Perfect for “Kids” of All Ages: Don’t be afraid of the stereotypes! Belly dance is a family-friendly art form that the whole family can enjoy, from Grandma and Grandpa to the little ones. There is no need to lock the kids away, in fact, they are usually the biggest fans! Get Your Cameras Ready: Carrara’s belly dance shows are not an ultra-choreographed performance, but a fully interactive experience designed to engage the whole crowd. Be prepared for plenty of photo ops! You never know who will get up and bust a move during the show! And Carrara is also happy to stick around for selfies with guests after her performance is over. Ready to raise the bar for all birthdays to come? We thought so! Contact Carrara today to check availability, save the date, and begin brainstorming the perfect birthday surprise! "Ms. Nour is an absolute delight! She danced at my daughter's Moroccan-Themed Birthday Party, and absolutely made our event a success. Her diverse performance was amazing! A brilliant, gracious, beautiful, and prompt professional; she brings a higher standard to Belly Dance while maintaining the beautiful culture, versatility in venue, and an incredibly approachable persona. Everyone (even my very shy daughter) was comfortable joining in the fun! Carrara Nour is the finest performer I have ever had the pleasure of working with, professionally or personally! You will be incredibly thrilled you chose her!" © 2019 Belly Dance By Carrara Nour. All rights reserved.